Virgo10's Laughing Place! Day 4 Continues And More! 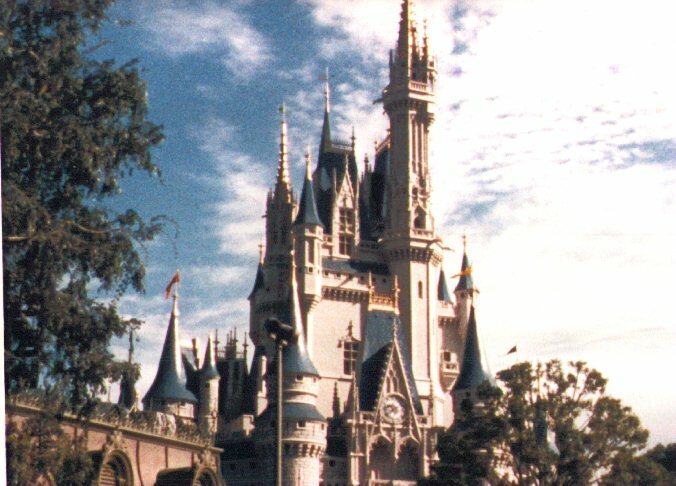 For Everything You Ever Wanted To Know About Disney, Check These Out. Click here to go to The Official Disney Site. Lots of fun stuff...click here. Click here to visit the one and only "Deb's Unofficial Walt Disney World Information Guide!" DON'T LET THEM TAKE OUR TOAD! Click here to find out more about this dastardly deed! Got back to PO around 1:30 and rested for a while. All that water is really relaxing. Took the boat from PO to the Market Place. Nice ride with some interesting views of the golf course and the tree houses. Some 25th Anniversary merchandise is already available. I bought a 25th Anniversary T-shirt among other things. Waited 30 minutes for a table at the Rain Forest Caf�. Had a salad with chicken that was absolutely delicious and a piece of chocolate Diablo Pie. Damn the calories�full speed ahead! I would give the food a 10. The restaurant itself was very interesting with the animals and thunderstorms but also very noisy. I was pleased with the service and did not feel rushed. After that, I took a bus to the Swan and whatever the heck that other thing is. To me it looks like a Cod! Walk to EPCOT via the Boardwalk. Wished they had done more with that idea. It�s like they had this great idea and then just lost their train of thought with it. I could almost see a local amusement park that we had here (Paragon Park) waiting to be reborn. Kiddie rides, a merry go round with brass rings, an old fashion roller coaster and on and on. Once in EPCOT, I went back to England and watched 2 shows of the British Invasion. They were absolutely fabulous. I ended up sitting next to several people from Massachusetts. We recognized each other from our accents. After that I also caught a performance of Romeo and Edna by the British Players. As Illuminations started I was in front of Italy and during the second half of it I started to walk around EPCOT going towards Mexico. It was fascinating to see the different views while the show was in progress. I highly recommend this but walk fast and watch where you�re going. Decided to give Blizzard Beach a try on Sunday morning although, to a New Englander like myself, the thought of snow is horrifying. I liked the concept more than I thought I would. The ride to the top of the mountain on the chair lift was truly breathtaking. Took the family type raft ride down. I was horrified to see that they were letting VERY young infants go down on that ride. No floatation devices on them�just held by their parents. This is a huge lapse in judgment by Disney and I hope they will change their policy on this before something tragic happens. I thought the kids area was very well done. All the little people seemed to be having a great time. Left BB around 1 p.m. and went back to PO to change. Then it was back to the Magic Kingdom for some more fun on Splash Mountain and Thunder Mountain. I also took in Snow White, Peter Pan and had one of my longest line waits for Mr. Toad. Snow White�s ride needs updating badly but the other 2 were great fun. We went out for supper at Whispering Canyons at the WL. The food is excellent, especially the fruit cobbler with mounds of vanilla ice cream. The wait staff was in a hilarious mood and we both enjoyed ourselves immensely. It was another beautiful day at Disney with clear skies and 90 degree temperatures. Day #6 and Day #7....Dreaming Disney Dreams. On Monday, the 16th, we traveled to Sea World. As this is a Disney News Group, I�ll sum it up with we had a great time. One point of interest is at Shamu�s show they have taught the whales to splash water even farther then they could before. Now the splash line can extend up as far as 10 rows into the top section! (For a pictures of this, Email me) When we returned in the late afternoon, we went to the pool and I had great fun sliding down the PO slide with the four year olds. Also I had my favorite WDW drink. It�s served pool side at the PO pool and is called the Serpentine. Kinda like a Strawberry Daiquiri without the liquor. Once again temperatures were in the 90�s and no rain. Do Floridians ever get tired of this weather??? It�s now Tuesday, 9/17. Picture this if you can. The woman is sleeping�dreaming Disney dreams�when suddenly there is a tremendous booming sound, which of course fits into her dream. But then there is another and another and the woman thinks, rats, it must be a thunderstorm which means rain. But wait�there�s more. Thunderstorms don�t usually come with music and she definitely hears music. It was at that point that the woman�s eyes flew open and she ran to the door. What is this? Fireworks!! Music!!! At 6:15 a.m.!!!!! Wow, now this is definitely a Disney Moment. She got dressed quickly and went to get coffee. Asked one of the cashiers at the restaurant and he replied, "Didn�t you ask for a wake up call?" Actually it was a dress rehearsal for the EPCOT 25th Anniversary. She wandered back to her room with her coffee and sat looking at the frog pond, listening to the birds wake up and smiling. I got to Splash Mountain as soon as the park opened and there was absolutely no wait! At Thunder Mountain there was about a 5 minute wait. And finally at Splash Mountain, I was able to keep my eyes open! Woo Hoo!!! Of course, I still screamed all the way down. As we walked towards The Time Keeper a show was taking place on the stage in front of the Pink Castle. It was music from all the Disney Movies and extremely well done. We watched that for about a half hour when the sun really started to get to me. Did a few more rides at the MK and then headed for MGM. MGM was new to my husband and I really enjoyed watching his reactions. The Back Stage tour was much improved. I especially liked when the torpedoes went off! I continued on to EPCOT just in time to catch Illuminations again. I just love that show.